The twice-annual Outdoor Retailer trade show, held next week in Utah, is a cornucopia of gear. Thousands of brands debut products for the coming year. Here’s our exclusive look at some of the most interesting outdoors items coming to market for 2018. At a hair under 6 ounces, The North Face Summit L5 Ultralight Storm Jacket is a waterproof-breathable shell made with airy 7-denier material. Packs down to the size of a big fist. $300 when it comes to market in December. Hilleberg touts its Mesh Tent 1 as an ideal choice for minimalist backpackers. It weighs just 410 grams with its mesh body and trekking-pole-compatible build. Pair with a tarp (as pictured) when precipitation is in the sky. Toad & Co. touts its Jasper Shirtjac as a “do-it-all layer.” The button-up hides tech touches like zippered pockets and a convertible collar for warmth when the wind kicks up. Made of a nylon/polyester/spandex blend with a DWR finish to repel weather if you’re caught out. Superfeet expands its footwear with the women’s Palisade, a Mary Jane silhouette (below), and the slip-on Mitchell shoe for men (above). These models are a part of a larger line the company will launch in 2018, all including the insole tech for which the company is known. Made for unsupported expeditions (think Denali, for one) The North Face goes big with its Prophet Pack. The hauler comes in 85- and 100-liter sizes. The brand put thought toward carrying all that load, including seeking three patents for features that self-equalize weight and give on-the-move adjustability. $439 when it goes on sale in early 2018. From a popular puffy coat to a lightweight sleeping bag, Mountain Hardwear expands its Ghost Whisperer line with a 900-fill primo mummy. GearJunkie got a first look at the bag earlier this month. Finally, a headlamp designed just for runners. The Petzl Bindi weighs just 1.2 ounces and kicks out up to 200 lumens. It has four lighting modes including red to preserve night vision and uses a rechargeable battery. At 2.15 pounds, the Foray 2P is among the lightest two-person tents on the market. The freestanding design has 30-square-feet of living space. The hubbed-pole skeleton supports a tent and fly with 20d no-see-um netting. In addition, a small vestibule offers additional space for gear. For its latest trail-runner Adidas offers an upper design with no dye. It has a Boa Closure System for adjustments and secure hold. A Continental Rubber outsole gives grip. Available in men’s and women’s for $120. Osprey goes super-light with the Levity and Lumina. The 45- and 60-liter packs weigh 1.76 and 1.8 pounds respectively. With lightweight but tough fabrics, the packs have a seamless harness, fixed top lid, removable compression cords, and side pockets. This pack already turned heads during its release in Europe. The Panga is YETI’s answer to the dry bag, and it delivers as a burly, reliable product. Made in 50-, 75-, and 100-liter sizes, the Panga is built to keep gear dry. Check out our YETI Panga review for more details. This adapter kit lets you use most water bottles as filters. Screw the two-stage filtration system onto a bottle to remove bacteria and protozoa (while also improving taste and reducing chlorine). It includes two screw-caps for wide and standard bottles and an interchangeable filter. $34.95. UST claims this lantern will run for 45 days continuously, kicking out 20 lumens of light for an incredibly long time. Or it can produce 360 lumens for 19 hours. The lantern runs on three D-cell batteries. The Fuse lets you set up two hammocks using only two anchor points. The aluminum alloy spreader bars allow hammocks to hang adjacent to each other so your companion stays close-at-hand, while keeping your hammock all to yourself. Child carrier with a roll cage? Yep. Kelty designed the Journey PerfectFIT with a locking aluminum roll cage inspired by those used in utility vehicles for child protection in the event of a fall. Buff’s latest fishing glove has anti-microbial fabric to keep from stinking and three-quarter length finger coverage. The silicone dot pattern aims to give grip and reduce wear. The BlockerLite Compression Dry Sack is waterproof and boasts an innovative compression system that minimizes “seam strain” and increases durability, all while compressing down into an efficient-packing block shape. The sack has a waterproof valve, which vents trapped air for quick and easy compression. Mountainsmith gives us a hiking backpack in the 2-pound range with the Scream 55 for men and Scream 50 for women. Built with durable but light nylon, these packs are among the more affordable ultralight models on the market at $160. Designed with polar explorer Eric Larsen, the Polar Ranger aims at the extremes of Seven Summits or polar exploration. Insulated with 800-fill Nikwax Hydrophobic Down, side vents open to allow arm use and customizable temperature control. Overlapping draft tubes prevent cold spots when zippers are closed. A snorkel hood controls frost created by breath and stops warmth-sapping drafts. Share your sleeping pad without the bounce. The NeoAir Camper Duo has two chambers so your sleeping partner won’t hit the ground when you get up in the middle of the night. Under Armour touts smooth heel-to-toe transition with the Horizon 50 trail shoe thanks to its added “cush.” An integrated collar prevents debris from entering the shoe, and a “podular” rubber outsole decreases weight by having rubber only where you need it for a secure grip. 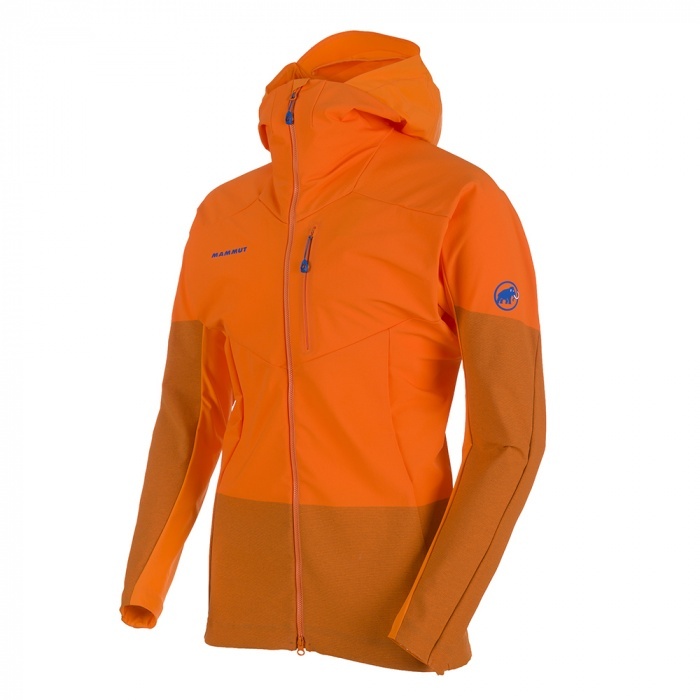 The Verglas Light Jacket bridges high output activities and cold weather. The mix of 800-fill down and softshell fabric gives protection and warmth in a single garment. This tent is made for cutting-edge expeditions, MSR touts. Meant to keep explorers and their gear sheltered for weeks or months on end, the Hubba Tour 2 has a unique exoskeleton to keep the tent body dry during set up in rainy weather. It also has a new waterproof coating that MSR claims lasts three times longer than standard coatings. This technology from Columbia, available in 18 styles when it hits the market next season, is literally shiny. It reflects light and heat, keeping the wearer cooler in bright sun. Check out our pre-release Omni-Shade Sun Deflector test. The Pilot 2N1 has SAXX’s “Ball Pouch” and is built from a knit-woven material. The breathable, fast wicking pin-dot mesh fabric will keep you moving freely, without chafing. The Global Companion fits like a backpack but functions like a suitcase. That’s the claim from Eagle Creek. Designed for adventure travelers, the Global Companion offers full access, organization, and security. Hydrapak’s highest capacity collapsible bottle yet holds eight liters of water. It also has an external capacity gauge to track your hydration intake or measure out contents for exact cooking. This $25 headlamp can shine up to 100 lumens, burn up to 40 hours, and runs on AAA batteries. It also focuses with one hand. Five Ten calls this its most comfortable approach shoe. Made with a knit upper, it has a “sock-like fit” and a non-marking rubber outsole. The Momentum is among Black Diamond’s first climbing shoes, and it has a knit upper for comfort. Molded rubber rounds out this entry-level shoe designed for long hours of comfort in the gym. Altra introduces a cushioned, light shoe. With zero drop and 30mm stack height, the DUO weighs just 7.9 ounces. It also has a soft tongue made of suede to prevent “lace bite” on the instep. This sleeping pad has “armor.” Klymit claims the pad is extra durable thanks to 300,000 precisely positioned “SuperFabric” scales. The 2lb 7oz pad has an R-value of 1.6. The Optimizer uses a new version of Gore-Tex Active waterproof/breathable fabric. It’s lighter and more comfortable than previous models. At 12.9-ounce, Outdoor Research touts this jacket as a versatile model for everything from mountaineering to backcountry skiing. This mountain bike helmet has a spot to hold sunglasses firmly in place when not in use. The visor adjusts to three positions and allows space for placing goggles securely between runs. It adapts to winter or rainy conditions with stowed vent caps that seal in heat. The helmet uses MIPS for protection against rotational forces in a crash. This 5-person shelter puts a premium on style. The Shenanigan has Wenzel’s proprietary red plaid or blue geometric graphics for an aesthetic that will stand out from the crowd. This 650-fill down, zipperless bag cuts weight for summer hiking. The top third of the bag has a wrapping quilt that tucks into the side of the bag and hooks to a loop to secure in place. The Ribelle Tech OD marries alpinism and trail running for ultralight, high-output mountain climbing footwear. Winner of the 2017 ISPO Product of the Year Award, the 1-pound, 3.4-ounce Ribelle has a Vibram mountaineering sole, semi-automatic crampon compatibility, a full-perimeter rubber rand and an integrated waterproof Outdry gaiter. This 1.1-ounce jacket packs into its own pocket and provides water and wind resistance. The long cut gives significant protection from the elements. The Radius ditches butane cartridges for electricity in this bug repeller. The battery heats a chemical repellent that gives you a buffer against bugs. Durable and versatile. Those are the words Petzl uses to describe the Boreo helmet. It’s made for mountaineering, climbing, caving, canyoneering, or via ferrata. It has a thick ABS crown, and EPP and EPS foam liner. This jacket uses Scholler’s new textile technology that weaves multiple materials into a single fabric. The result is nearly seamless clothing that melds fabrics in a unique way. No seams also mean better fit, stretch, and durability, the brand touts. The South Rim is a light boot for warm-weather hiking. It’s built on the Vibram SPE platform from Danner’s best-selling Mountain 600 hiking boot. The brand added a lightweight suede and mesh upper for breathability. Paddle to remote locations with a friend. The Red Paddle Voyager Tandem is tailored to the needs of two explorers who want to carry their kit. It has two luggage spaces with tie-downs to keep everything secure. Let gravity do the work with the BeFree 3L water filter. Drink directly from the reservoir or refill your bottle and bladder with the integrated flexible 3.0L reservoir and microfilter. The 0.1-micron filter removes bacteria and protozoa. Otterbox just released this line of bear-resistant, high-end coolers, and will show them at OR. We previewed the cooler, and it looks well designed. It stands apart with many customizable accessories. The Cloud has no zippers. Modeled after the successful Backcountry Bed, the Cloud is light (1lb 7oz for the 35-degree version) and fairly priced at $270 for an 800-fill down bag. These cutlery sets (fork, spoon, and knife) are made with certified organic bamboo. Each utensil is hand-shaped from a single piece of bamboo. After shaping, sanding and cleaning, a light food-safe oil is applied. These flops have 100% recycled cork footbeds and midsoles with SOLE’s signature supportive shape, a modern low-profile, and colorful TPU straps. Call it a tinder-stick or a really big match, the 5.5-inch Stormproof Sweetfire Behemoth has a burn time of 15 minutes. UCO claims it’s “the most submersible tinder” so don’t worry about getting it wet or going out.